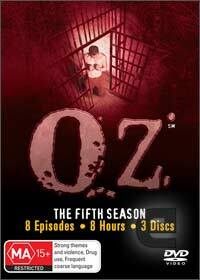 Oz is one of the most gripping drama series of all time that is set in a maximum penitentiary in the united states. Created by acclaimed Tom Fontana of Homicide: Life on the Street, the inmates of Oswald State Penitentiary contain the countries most dangerous felons who under the watchful eye of Warden Leo Glynn (Ernie Hudson) attempts to create a social experiment within his walls of his "mock city" as prisoners attempt to live their everyday lives which also contains the hardships of the outside world. This dangerous mixing pot contains prisoners from all walks of life and nationalities which makes this one of the most engaging drama series to date. Featuring first class acting by Eamonn Walker, Lee Tergesen with the series being narrated by inmate Augustus Hill (Harold Perrineau), Oz Season 5 once again continues the tradition of the previous series and although you can sit down and start watching from Season 5, you really need to know some of the back history of the characters so go out and rent season one on DVD and if you like it, buy all five seasons.